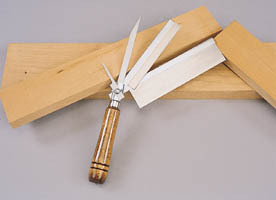 The comfortable wooden handle on this special Razor Saw Set holds a nest of four interchangeable steel blades that can be attached and removed with a single wing nut. Ideal for all types of work where precision is important. Order on the Web or by Phone, if you prefer -- (937) 890-5197. © SHOPSMITH - DREAM IT! BUILD IT! SHARE IT!